Thames township, or "The Thames" as it was often referred to is located on the southern shores of the Hauraki Gulf. European traders and missionaries began to settle in the area 130 years ago. 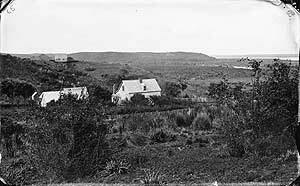 Marutuahu survivors of the early 1800s inter tribal warfare, returned to live peacefully in the area also. 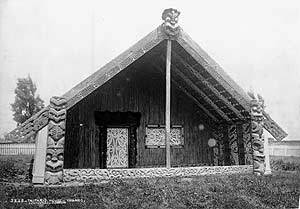 "Ngati Maru chief Hoterene Taipari expressed the Maori attitude when he said in a speech at Parawai that the Marutuahu were tired of war; they wanted all tribes and all races to live in peace together, as one family. If the pakeha met with opposition when seeking timber or mining rights it was only over details: the over-ruling Maori spirit was one of co-operation"(1). The first major discovery of gold was made on August 10, 1867 by a prospector, William Hunt, in a waterfall in the bed of the Kuranui Stream. This mine produced over 102,353oz bullion and was known as the Shotover. The era from 1868 to 1871 were the bonanza years for the town with gold production topping one million pounds sterling at its peak. Official figures for production of the Thames Mines recorded a yield of 2,327,619oz bullion with the value at $845 million. The richest bonanza of the fields were the Manukau-Golden Crown-Caledonian mines but many others yielded near equivalent amounts Towards the end of the last century Thames was the largest centre of population in New Zealand with 18,000 inhabitants and well over 100 hotels and three theatres. 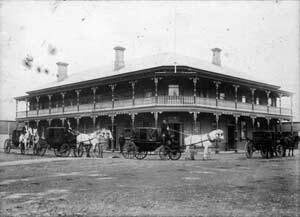 The population today stands at approximately 7,000 and now has only four hotels in the town centre. In the 1830s a group of convicts, ship deserters and whalers who had settled on Beesons Island near the entrance to Coromandel Harbour reported discovering gold, but this and other reports about this time attracted little interest. It was the discovery of gold in the South Island that led to a series of gold rushes and the establishment of what soon became a major industry. In 1856, gold was found in the Aorere Valley, and a gold rush to the Collingwood-Takaka district followed. Gabriel Read reported the discovery of gold in the gravels of the Waitahuna and Tuapeka rivers in 1861, and a major gold rush to Central Otago followed. There was a smaller rush to Marlborough the following year, and rushes to finds on the West Coast in 1865 and 1866. Recorded gold production in 1866 reached 735,000 ounces (over 22 tonnes), a level that has not been exceeded since then. The early miners used primitive equipment, gold pans and sluice boxes with the gold-bearing gravel being shoveled by hand. Hydraulic methods using high-pressure water were developed to work elevated terrace deposits, and water races were built over long distances, often through rough terrain, to convey water to the mine sites. As the more accessible, near-surface deposits were worked, attention turned to the large gravel deposits along the main rivers, particularly the Clutha River and its tributaries in Otago. After numerous unsuccessful attempts, the first steam powered dredges started work on the Clutha River in 1881. The world's first commercially successful gold dredge was the Dunedin, which continued to operate in the Clutha River until 1901 by which time it had recovered 17,000 ounces (528 kg) of gold. 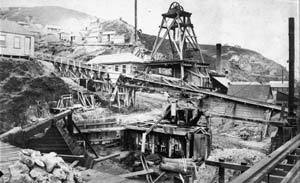 More than 200 gold dredges operated in Otago and Southland between the 1890s and 1915. Hard rock gold mining took longer to get established, requiring capital and expertise beyond the capacity of the alluvial miners. Gold production from quartz vein deposits commenced in the early 1860s with rock crushing batteries being set up to crush the gold-bearing rocks to allow the gold to be recovered. In 1867 the goldfield at Thames started producing, and in 1875 the Waihi area became open to prospecting. A gold rush followed but the miners failed to recognise the potential of the quartz vein deposits they discovered, including the Martha vein, discovered at Waihi in 1878. Gold in the quartz veins of the Hauraki district is very fine grained and was difficult to recover using the methods available at the time. The first commercial use of a new process using cyanide solution to recover gold was at the Crown Battery at Karangahake in 1889. The Government bought the New Zealand rights to the cyanide process, and users had paid off the Government investment by 1905. The success of the cyanide process led to a major expansion of the Martha mine, which by 1903 was the largest gold mine in New Zealand. The Victoria battery at Waikino was expanded, the Cornish pumphouse (which is still standing) was completed and new underground workings were developed.By 1911 Waihi had a population of 6500 and was the largest town in the region. When the Martha mine eventually closed in 1952 it had produced about 5 million ounces of gold (155 tonnes) and 35 million ounces (1088 tonnes) of silver from nearly 11 million tonnes of ore which was mined almost exclusively by underground methods. The mine is still worked today as an open pit and is the largest known hard rock mineral deposit in New Zealand. Elsewhere in the Hauraki Goldfield, gold-silver production is recorded from several hundred mines working about 50 separate deposits. The total value of gold and silver produced from the Hauraki Goldfield is about $6700 million at current metal prices. While alluvial gold mining dominated in the South Island after the gold rushes, hard rock mines were developed in Nelson, Westland and Otago. 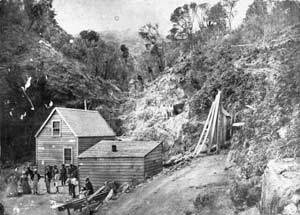 The Reefton Goldfield, on the West Coast of the South Island, produced more than 2 million ounces (62 tonnes) of gold from 1870 until 1951. The largest producer was the Blackwater mine at Waiuta. Gold was also produced from the gold-scheelite veins of Otago from the early 1870s but it was not until the Macraes mine was developed in 1990 that the region became a significant producer of gold from hard-rock mining. Throughout most of the 20th century, production declined due mainly to the falling real price of gold. As the hard rock gold mines closed and gold dredging diminished, soon only the Kanieri dredge on the Taramakau River remained as a significant gold producer. Rising gold prices from the mid-1970s led to a surge of investment in gold exploration and production after more than 50 years of decline. At its peak in the mid-1980s about 20 exploration companies were active and a string of discoveries were made, including the Martha and Golden Cross mines at Waihi, the Macraes mine in Otago, and the Globe-Progress prospect at Reefton. Gold production increased from less than 10,000 ounces (311 kg) in 1983 to 390,000 ounces (12 tonnes) in 1995, an output last achieved 80 years ago.